The Arroyo Grande Eagles beat Paso Robles boys basketball team 74-42 Wednesday night at Gil Asa gym. The Eagles jumped out to an early lead, then outscored the Bearcats 20-5 in the second quarter to lead 36-12 at half-time. In each of the final two quarters, Arroyo Grande outscored the Bearcats by only four points, but it extended their insurmountable lead. Arroyo Grande improves to 9-2 in league (22-5 overall) for the season. 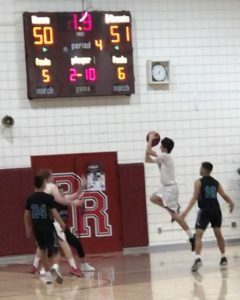 Paso Robles falls to 3-9 in league (10-17 overall). The Eagles will represent the Mountain League in the central section CIF play-offs.